Sub: VII Central Pay Commission recommendations – Submission to the empowered Committee Secretaries- reg. 1. Bharat Pensioners Samaj(BPS) Federation of pensioners’ associations, a conglomerate of over 628 pensioners’ organizations as an accredited Federation under the Government of India, had appealed to the Secretary, Ministry of personnel, Public Grievances and Pensions, on 16.2.2016 during the meeting on Aadhar seeding to hold a meeting of Pensioners Associations to discuss 7th CPS pension related recommendations, though he had agreed to hold such a meeting but it did not materialize. 3. It is hard to believe, how a department meant for the welfare of pensioners which helped pensioners to get better deal in earlier pay commissions could arrive at such a damaging and misleading decision without even consulting the stake holders. Undersigned in the capacity of Secy. 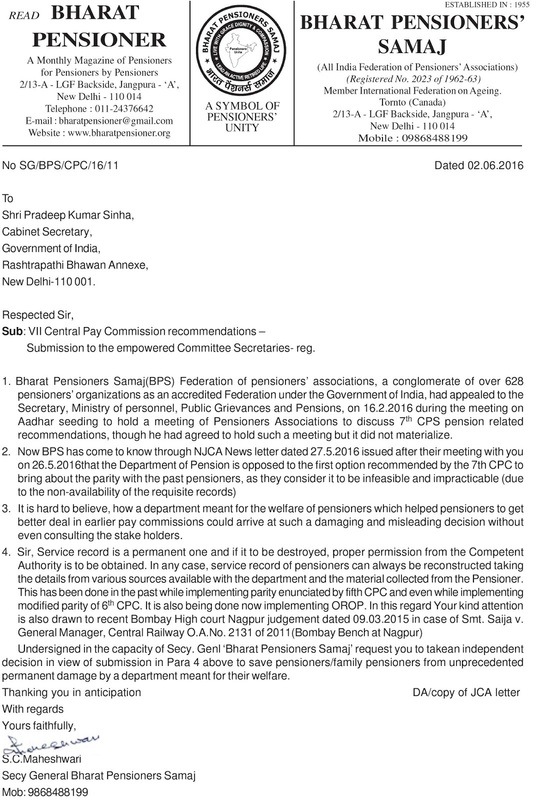 Genl ‘Bharat Pensioners Samaj’ request you to takean independent decision in view of submission in Para 4 above to save pensioners/family pensioners from unprecedented permanent damage by a department meant for their welfare. I personally condemn the advice given by DOPPW to Cabinet Secretary. Before forwarding his letter he needs to understand that in case of non availability of record, it needs to be constructed through many sources available as well with the help of the pensioners too. Such sort of action taken hurriedly could be avoided and does not go in line with the pensioners welfare. Atleast the official forwarding letter should think twice about the department opened for the benefit of the elderly persons and not snatching their legal and valid rights.